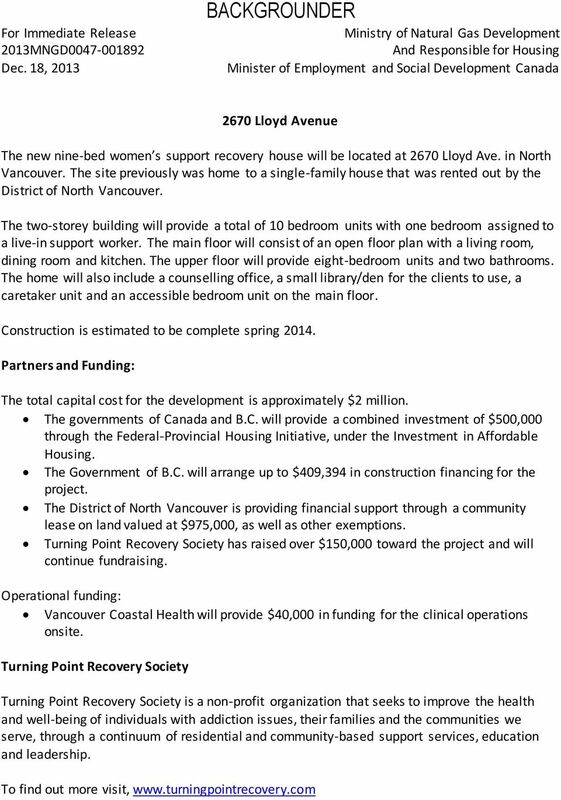 1 For Immediate Release 2013MNGD Dec. 18, 2013 NEWS RELEASE COMMUNIQUÉ Ministry of Natural Gas Development And Responsible for Housing Minister of Employment and Social Development Canada New supportive housing for women underway on North Shore NORTH VANCOUVER Construction began today on a new nine-bed supportive recovery development for women with substance addictions in North Vancouver. Funding for the building is provided by the governments of Canada and British Columbia, along with the District of North Vancouver and community partners. Through investments in affordable housing, our Government is providing assistance to those who need it most here in B.C. and in all corners of the country, said Andrew Saxton, Parliamentary Secretary to the Minister of Finance and Member of Parliament for North Vancouver, on behalf of the Honourable Candice Bergen, Minister of State for Social Development. We are committed to making communities stronger through projects like these. We remain focused on four priorities, as outlined by the Prime Minister, that Canadians care about most: their families, the safety of our streets and communities, their pride in being a citizen of this country, and of course, their personal financial security. 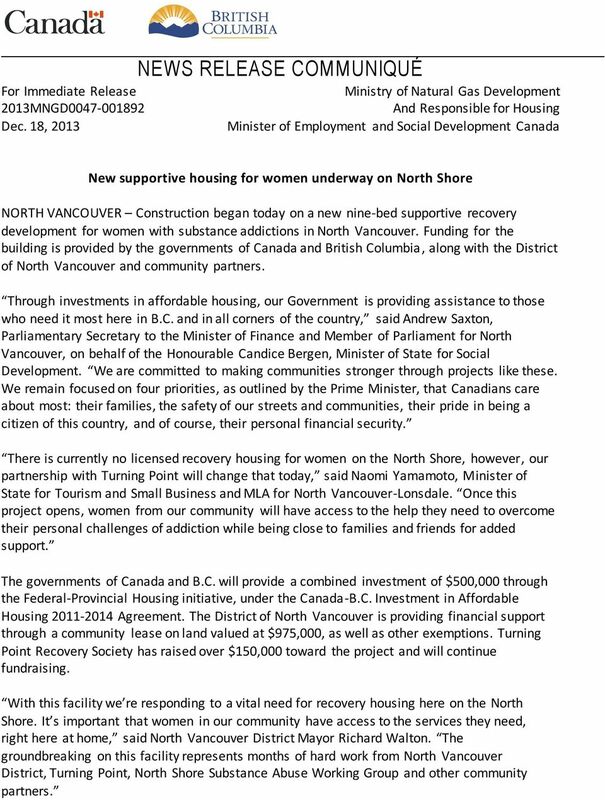 There is currently no licensed recovery housing for women on the North Shore, however, our partnership with Turning Point will change that today, said Naomi Yamamoto, Minister of State for Tourism and Small Business and MLA for North Vancouver-Lonsdale. Once this project opens, women from our community will have access to the help they need to overcome their personal challenges of addiction while being close to families and friends for added support. The governments of Canada and B.C. 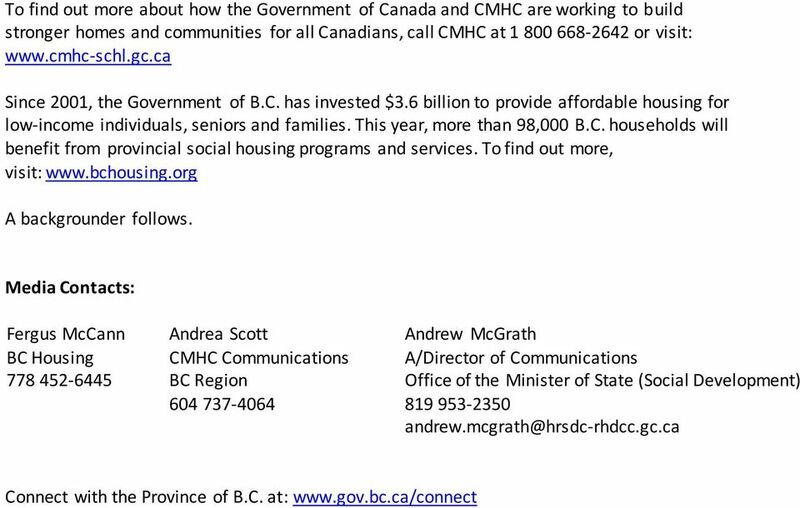 will provide a combined investment of $500,000 through the Federal-Provincial Housing initiative, under the Canada-B.C. Investment in Affordable Housing Agreement. The District of North Vancouver is providing financial support through a community lease on land valued at $975,000, as well as other exemptions. Turning Point Recovery Society has raised over $150,000 toward the project and will continue fundraising. With this facility we re responding to a vital need for recovery housing here on the North Shore. It s important that women in our community have access to the services they need, right here at home, said North Vancouver District Mayor Richard Walton. The groundbreaking on this facility represents months of hard work from North Vancouver District, Turning Point, North Shore Substance Abuse Working Group and other community partners. 2 The project, located at 2670 Lloyd Ave. in North Vancouver, will accommodate a maximum of nine women with one bedroom designated for a live-in support worker. Priority placement will be given to women from the North Shore. Vancouver Coastal Health will provide $40,000 in annual operational funding for program operations onsite. Turning Point Recovery Society will manage and operate the women s recovery home and provide counselling, education, support and other program services for the clients. 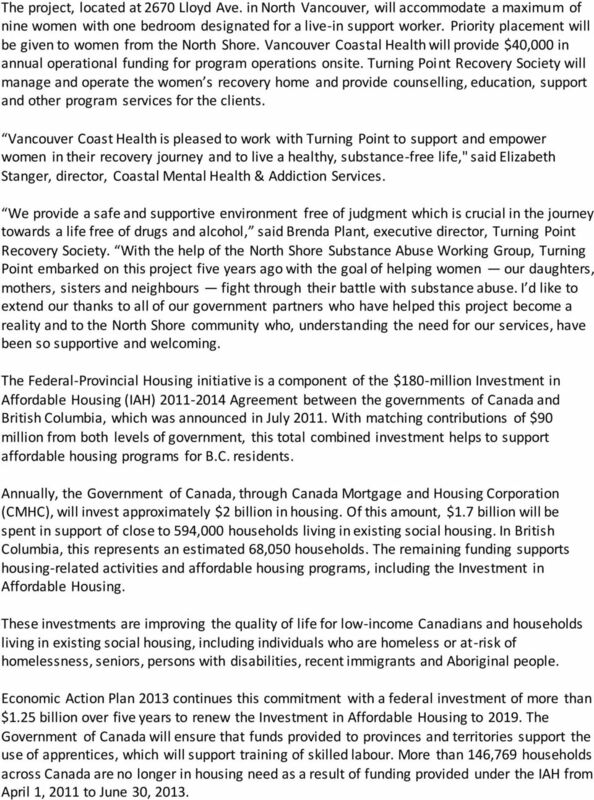 Vancouver Coast Health is pleased to work with Turning Point to support and empower women in their recovery journey and to live a healthy, substance-free life," said Elizabeth Stanger, director, Coastal Mental Health & Addiction Services. We provide a safe and supportive environment free of judgment which is crucial in the journey towards a life free of drugs and alcohol, said Brenda Plant, executive director, Turning Point Recovery Society. With the help of the North Shore Substance Abuse Working Group, Turning Point embarked on this project five years ago with the goal of helping women our daughters, mothers, sisters and neighbours fight through their battle with substance abuse. I d like to extend our thanks to all of our government partners who have helped this project become a reality and to the North Shore community who, understanding the need for our services, have been so supportive and welcoming. The Federal-Provincial Housing initiative is a component of the $180-million Investment in Affordable Housing (IAH) Agreement between the governments of Canada and British Columbia, which was announced in July With matching contributions of $90 million from both levels of government, this total combined investment helps to support affordable housing programs for B.C. residents. Annually, the Government of Canada, through Canada Mortgage and Housing Corporation (CMHC), will invest approximately $2 billion in housing. Of this amount, $1.7 billion will be spent in support of close to 594,000 households living in existing social housing. In British Columbia, this represents an estimated 68,050 households. The remaining funding supports housing-related activities and affordable housing programs, including the Investment in Affordable Housing. These investments are improving the quality of life for low-income Canadians and households living in existing social housing, including individuals who are homeless or at-risk of homelessness, seniors, persons with disabilities, recent immigrants and Aboriginal people. Economic Action Plan 2013 continues this commitment with a federal investment of more than $1.25 billion over five years to renew the Investment in Affordable Housing to The Government of Canada will ensure that funds provided to provinces and territories support the use of apprentices, which will support training of skilled labour. More than 146,769 households across Canada are no longer in housing need as a result of funding provided under the IAH from April 1, 2011 to June 30, 2013. Proposal Development Funding This program provides repayable interest-free loans to facilitate the development of affordable housing. MINISTRY OF COMMUNITY, ABORIGINAL AND WOMEN'S SERVICES The mission of the Ministry of Community, Aboriginal and Women's Services is to build stronger communities for all British Columbians through partnerships. SMART Fund Funding Guidelines* About the SMART Fund The Sharon Martin Community Health Fund (SMART Fund) is a Vancouver Coastal Health grants program that invests in community-based health promotion programs. A housing strategy and policy framework for Manitoba. A housing strategy and policy framework for Manitoba. Other Important Information. Apply On-Line! Is Canada Ready to Play in the Big Leagues in Attracting Investment?